A lifetime ago, Meek Mill and Drake were each other’s sneering villains, taunting each other on wax and social media. Seeing them collide, literally and figuratively, in their new video for “Going Bad” can make you emotional, given everything that they have put each other through. The pair, along with video director Kid Art and countless rapper pals, have combined for one of the sleekiest visuals released this year thus far. Check it out below. “Going Bad” is all about the feels it gives off. There’s a ton of powerful black faces in the music industry strolling through a luxurious pantheon, although there’s only one woman that appears in the video. Meek and Drake are in the center of the ruckus, of course, with the kind of suave, blank stares associated with being cooler than anyone else. Surrounding them are a number of are members of contemporary hip-hop’s brass – Nipsey Hussle, T.I., Swizz Beatz, and more – who match their stale faces in intensity. It’s never really revealed where exactly they are walking to, but it doesn’t matter. We’re all just really here to see the swaggering stroll, not necessarily where it leads. The most visually striking part comes when Meek and Drake play chicken with expensive cars and they both lose. From the beginning, both rappers are revealed to be speeding in their respective cars to locations unknown. After Drake’s verse ends, we see what they’re doing – planning to drive full force into each other. Yikes. 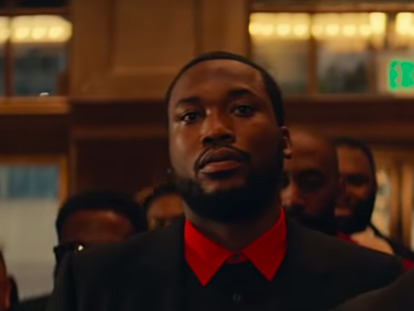 They collide in a mess of crumpled car metal and tire confetti before Meek begins his verse after a brief interlude, almost like this collision is a “passing the baton” moment. It could signal their inevitable reunion; they avoided each other for so long after beefing in 2015 that they are now back together, physically. Or maybe it’s just a CGI effect that Meek decided would look cool with the whole “boss” motif going on. “Going Bad” appears on Meek’s 2018 album Championships. He’s released videos for “Intro” and “Trauma” since its release. This month, he’s embarking on a tour in support of the LP.